Iconographic Features: Bird Mythical Being 6 (BMB-6) depicted four-legged and with two trophy heads in its beak. Torso covered by trophy heads. 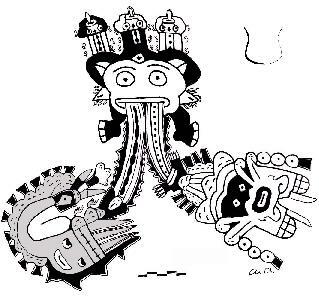 Trophy head with extended tongue in form of a serpent. Feathers replaced by snakes. Anatomy looks compressed. Foxes might indicate environment or fox hunt. 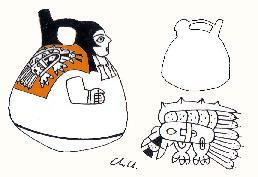 Description: collared jar, redrawn after Wolfe 1981. Iconographic Features: Bird Mythical Being 7 (BMB-7) depicted four-legged (two human legs, two legs of a bird) and with three trophy heads in its beak. Head and torso form an oval. Wing is covered with trophy heads. Feathers are replaced by snakes. Two serpents appear on the left side. 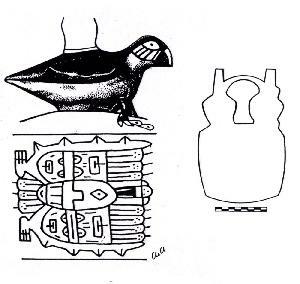 Description: effigy vessel, redrawn after Wolfe 1981. Iconographic Features: Bird Mythical Being 7 (BMB-7) depicted on the mantle of a noble woman. Description: jar, redrawn after Bosqued 1985. Iconographic Features: Bird Mythical Being 8 (BMB-8) depicted in bird’s-eye view and with trophy head in its beak. Head and torso form an oval. Wings and tail are covered by trophy heads. Feathers replaced by snakes. Anatomy looks compressed. Trophy head appears on the left side. 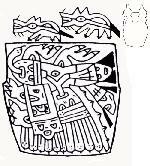 Iconographic Features: Bird Mythical Being 8 (BMB-8) depicted in bird’s-eye view and with trophy head in its beak. Head and torso form an oval. Wings are covered by trophy heads. Feathers replaced by snakes. Anatomy looks compressed. Parrot (loro) at the top might indicate parrot hunt or harvest. Description: ceramic cup bowl, redrawn after Bosqued 1985, fig. 279. Iconographic Features: Harpy and Horrible Bird. Harpy is depicted with human head and avian body. Horrible Bird is depicted with a carrying cord (?) or cap (?) in its beak. Description: ceramic cup bowl, redrawn after Bosqued 1985, fig. 264. 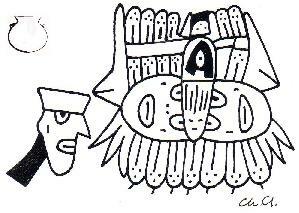 Iconographic Features: Harpy and unidentified bird creature (depicted in bird’s-eye view). Harpy is depicted with human head and avian body. Iconographic Features: Two Harpies and two unidentified bird creatures. One of them (right) is depicted with head of the Harvester. Iconographic Features: Harpy holding a rattle. Depicted by using the convention of Animal Emblem Format. Description: collared jar, redrawn after Bosqued 1985. Iconographic Features: "Natural" Bird with small beak, speckled body and mythical wingborder. Feathers are replaced by snakes. Polliwogs on the right side indicate water. Bird might be associated with riverside vegetation. Category Not-so-horrible-Birds. Iconographic Features: "Natural" Bird with small beak and speckled body. Feathers are replaced by snakes. Chiton beneath the tail indicate coastal environment. Category Not-so-horrible-Birds. Iconographic Features: Long-necked "Natural" Bird with trophy head decoration on the wing. Two fishes on the right and the left side indicate water. Category Not-so-horrible-Birds. Iconographic Features: Long-necked "Natural" Bird with trophy head decoration on the wing. Association with spears. Spears might indicate bird hunt. Description: cup bowl, redrawn after Wolfe 1981, fig. 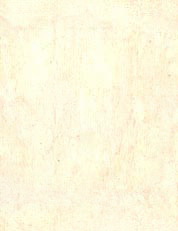 191. 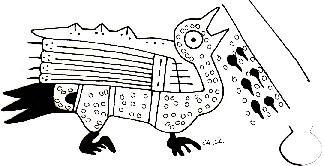 Iconographic Features: Crested Bird with trophy head decoration on the wing. Category Not-so-horrible-Birds. Description: cup bowl, redrawn after Bosqued 1985, fig. 3. Iconographic Features: Rayed Feline Head depicted with human legs. Extrusion from the mouth in the form of two serpents to which the Crested Bird (grey) and Feline Hawk are attached. Crested Bird depicted with carrying cord in its beak (compare with CL 23, 57, 112).